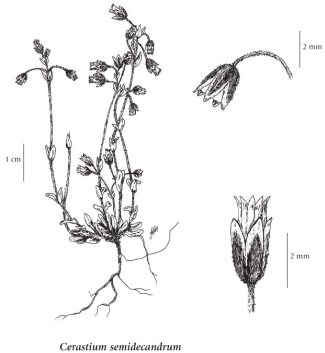 Annual herb from a slender taproot; stems erect to ascending, branched, hairy, sometimes glandular, 1-20 cm tall. Basal leaves oblanceolate with a stalk-like base; stem leaves opposite, egg-shaped to elliptic-oblong, 5-18 mm long, white-hairy; stipules lacking. Inflorescence in a spreading cluster; flowers stalks at first sharply deflexed at the base, later almost erect, glandular-hairy; petals 5, white, narrow, 2-4 mm long, slightly notched; sepals 5, narrowly lanceolate, sharp-pointed, 3-5 mm long, glandular-hairy, broadly papery-margined. Mesic to dry roadsides and fields in the lowland zone; rare in SC BC, frequent in SW BC, known from S Vancouver Island and lower Fraser Valley; introduced from Eurasia.